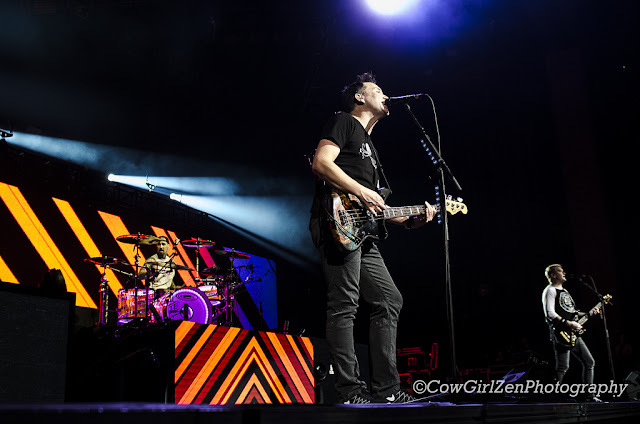 There are those bands that seem to be timeless and Blink-182 is one of those bands that take you back to the place you first heard their shenanigans with eagerness. You knew your parents weren't going to approve, so that made and still makes Blink 182 the quintessential punk band we love even more today. 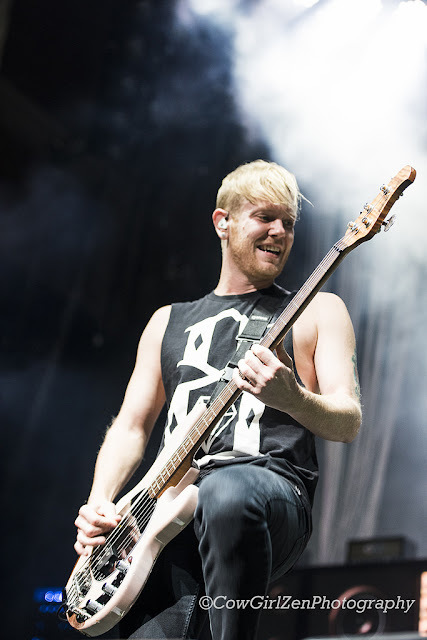 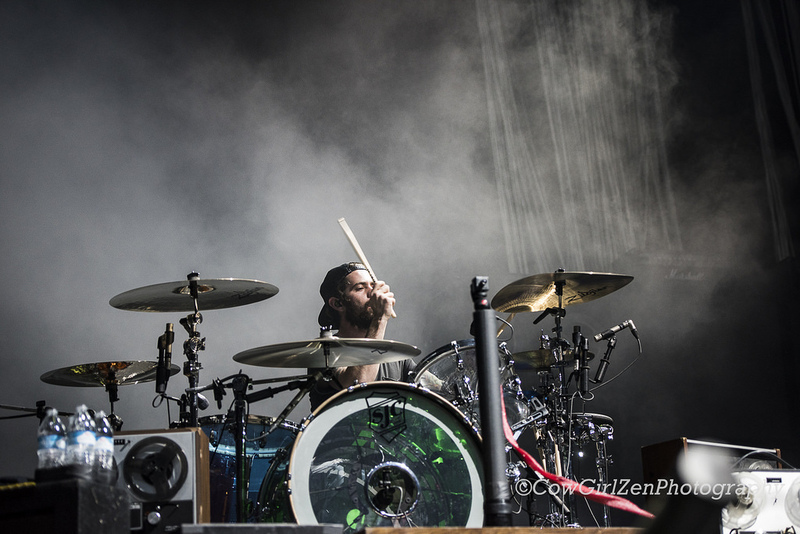 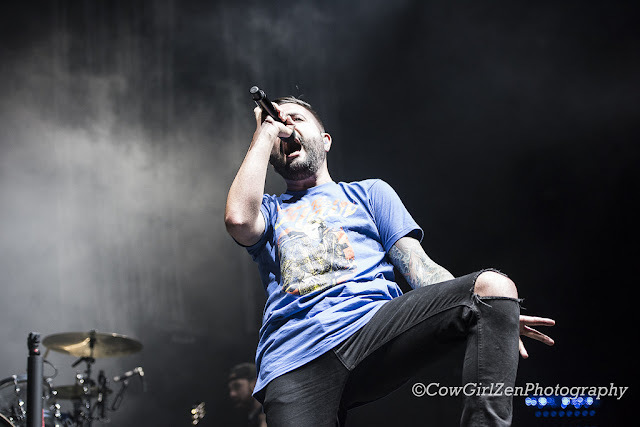 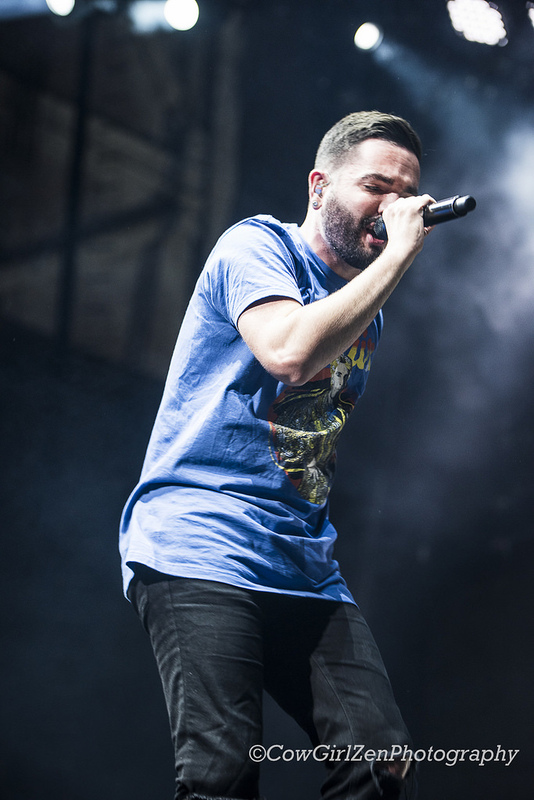 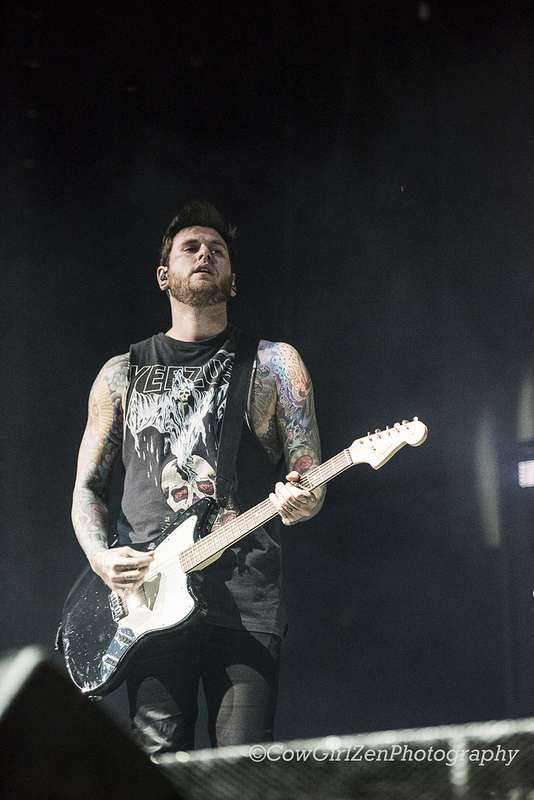 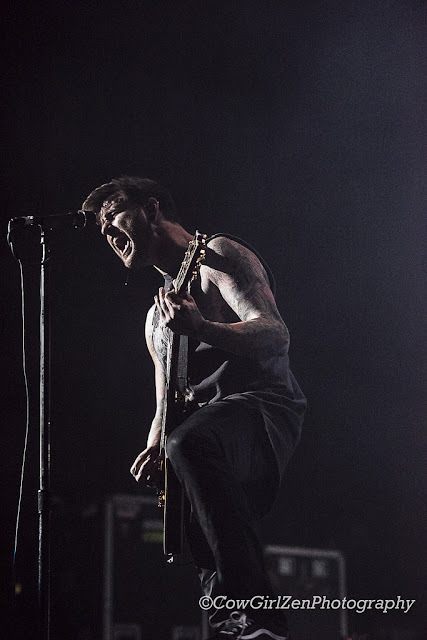 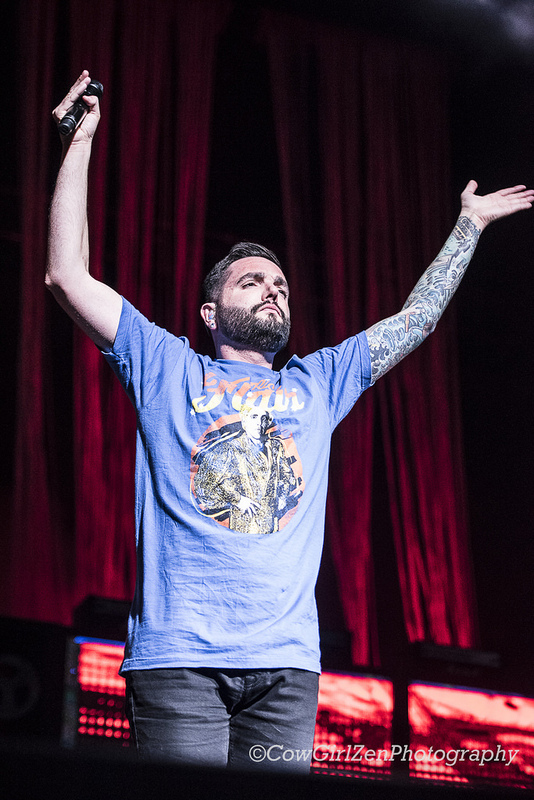 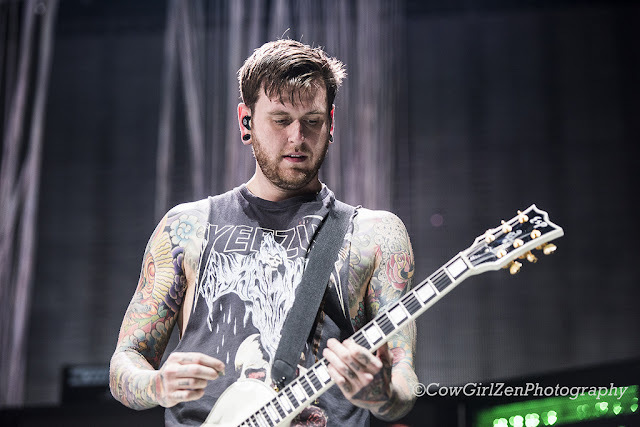 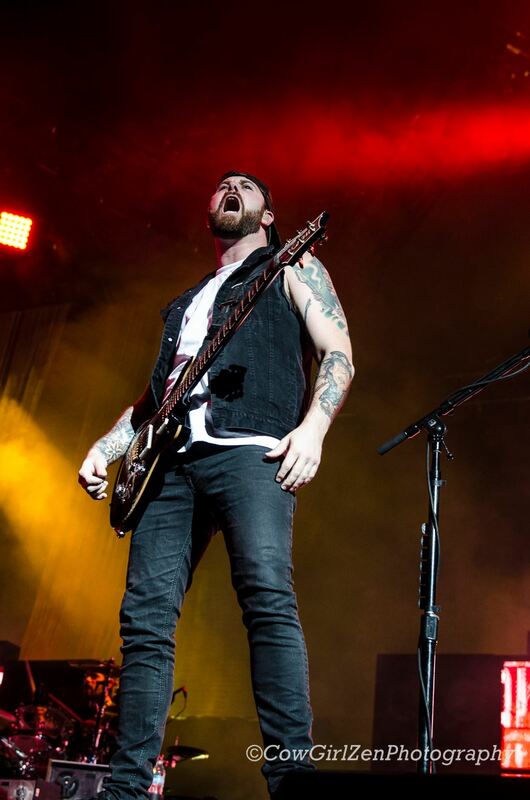 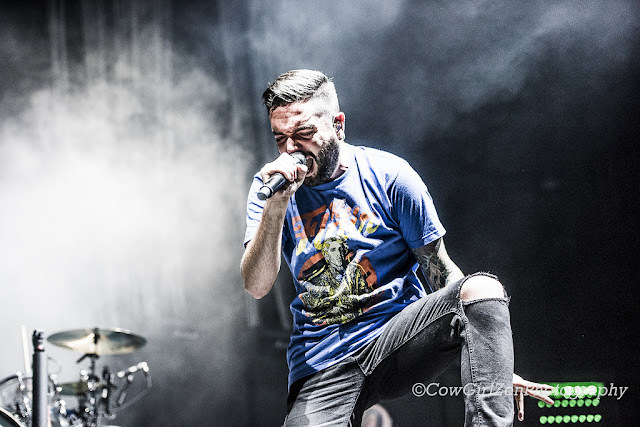 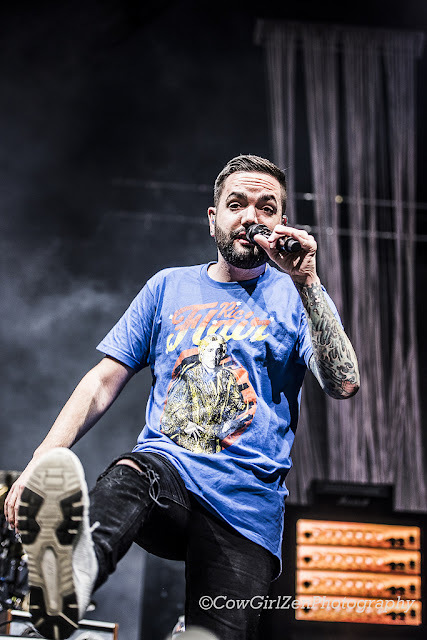 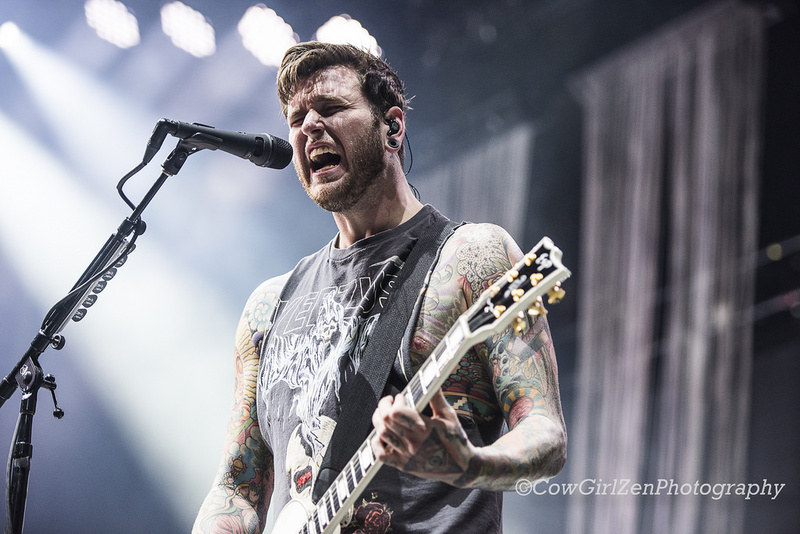 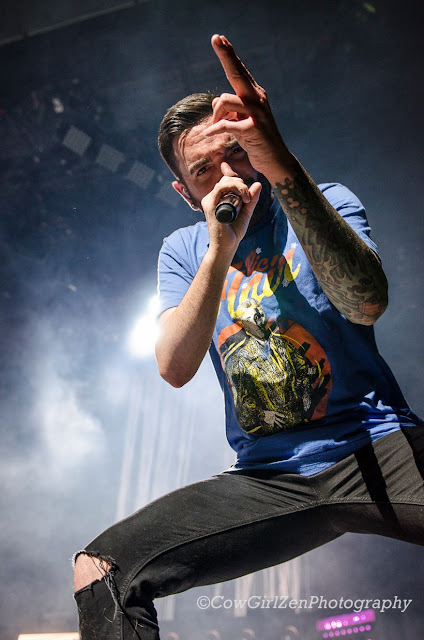 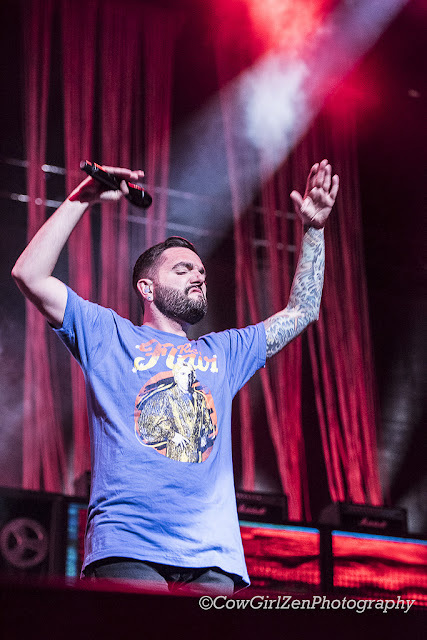 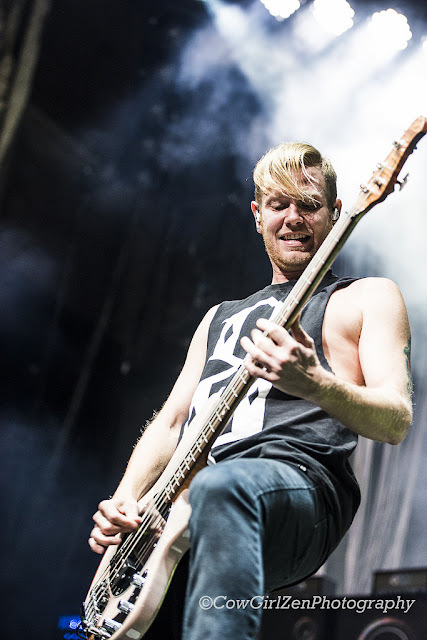 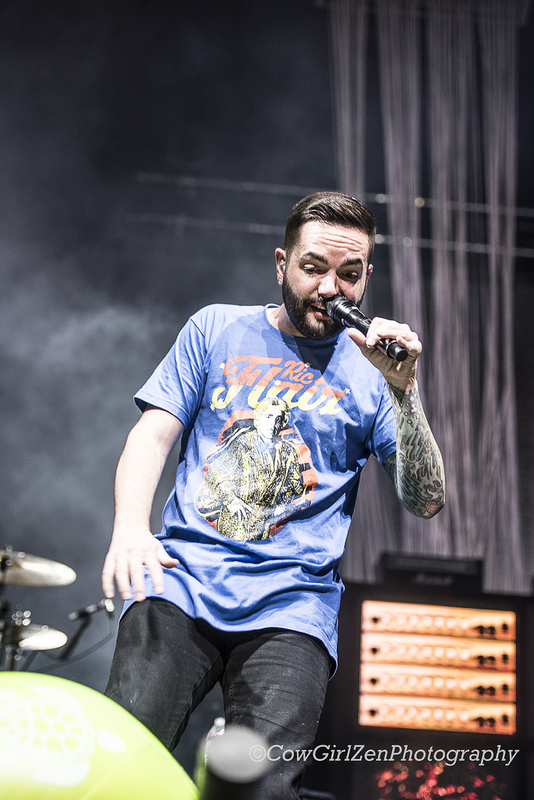 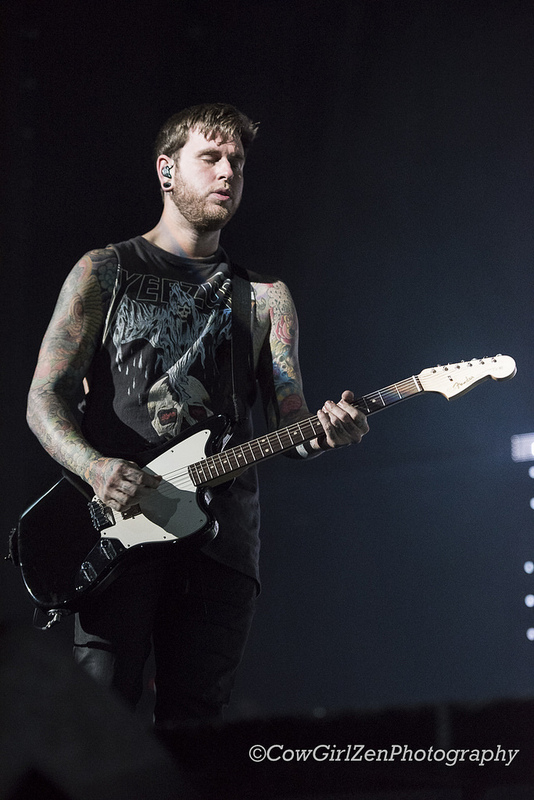 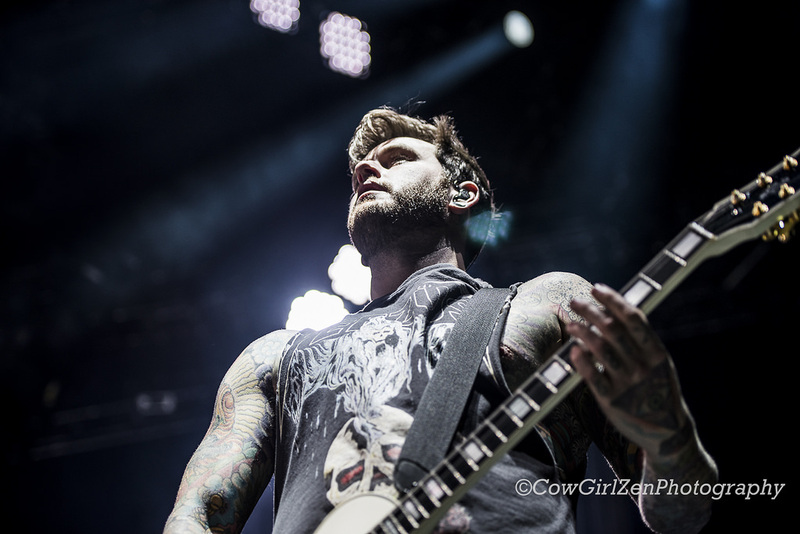 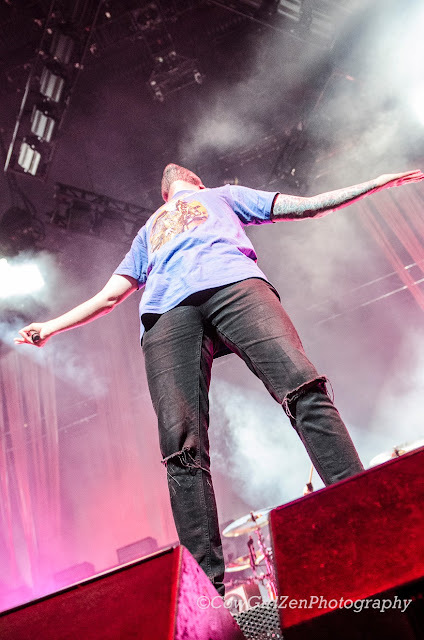 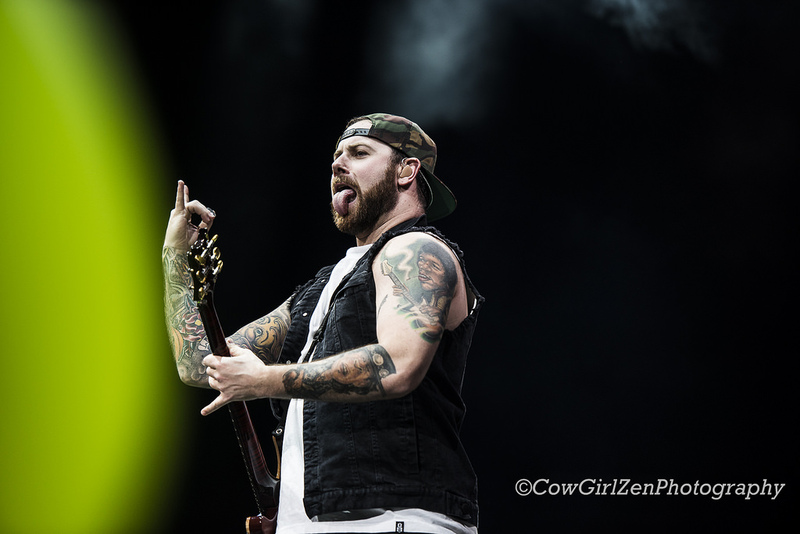 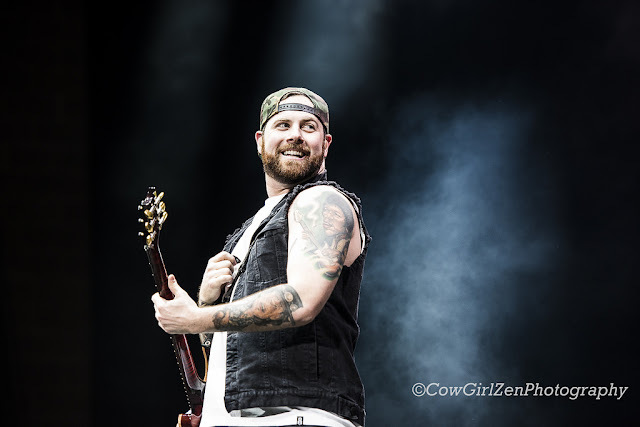 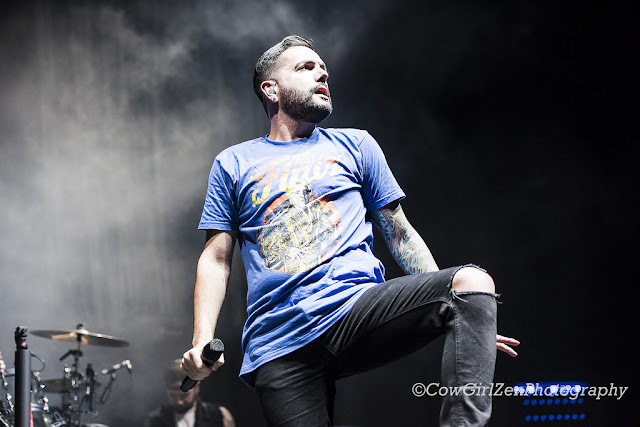 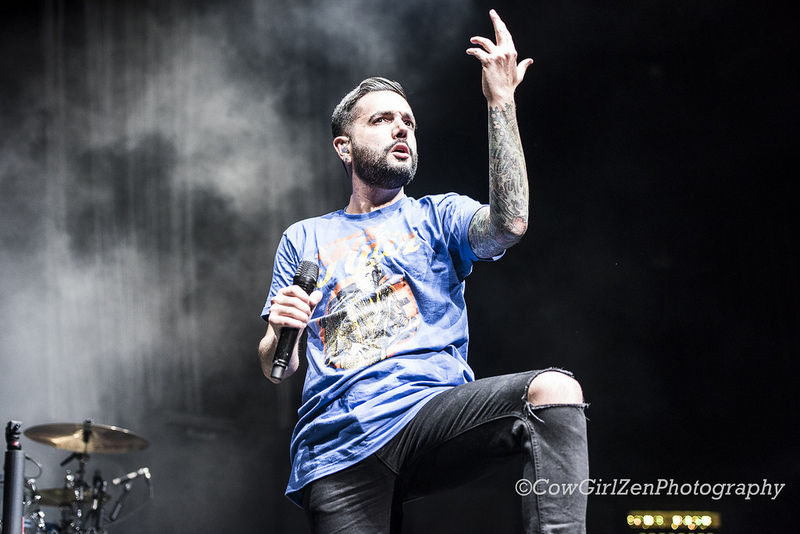 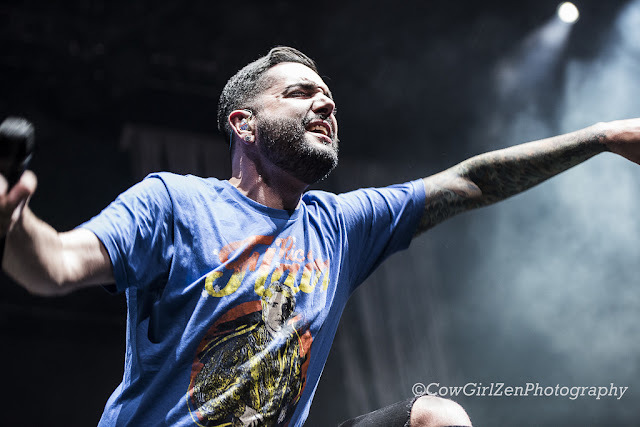 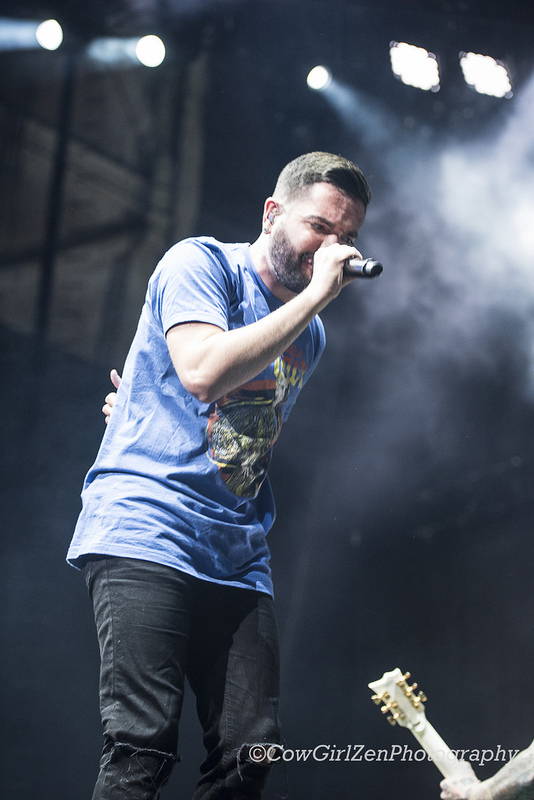 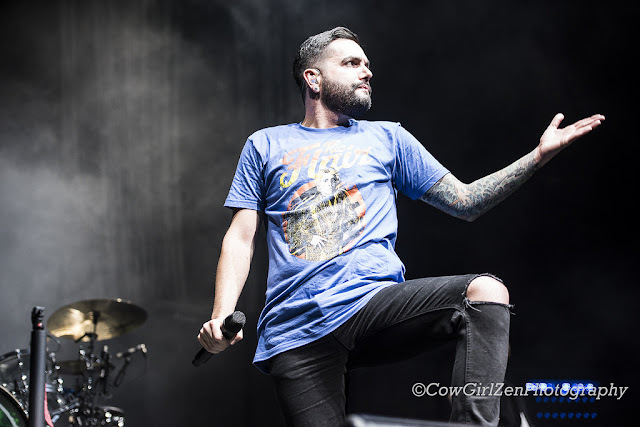 Currently out on tour along with A Day To Remember and All Time Low each band brought their distinctive energy and vibe with them. 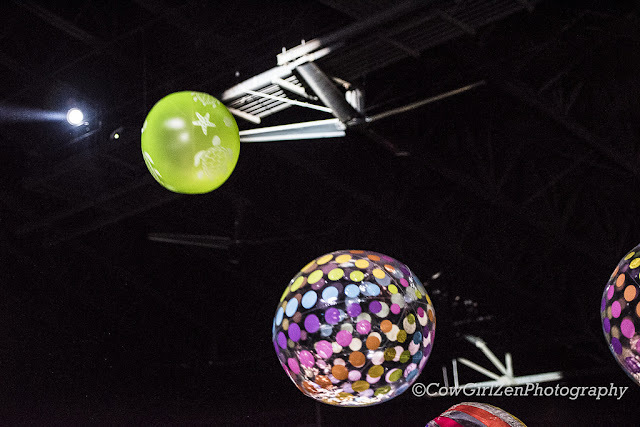 Covering tunes and bouncing colourful balls back and forth between themselves and the filled stadium at the AK-Chin Pavilion in Phoenix, Arizona on a warm autumn Saturday evening, September 24th, 2016. 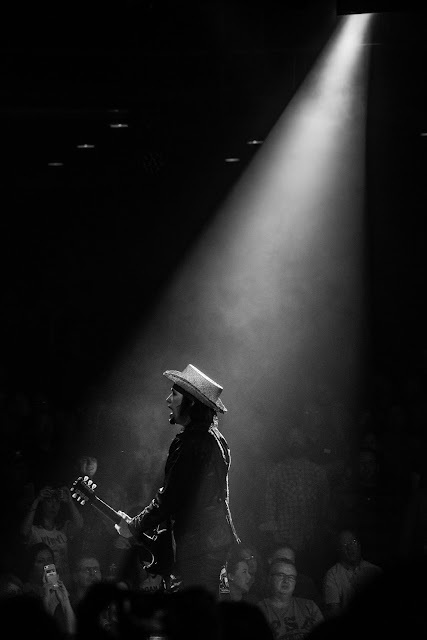 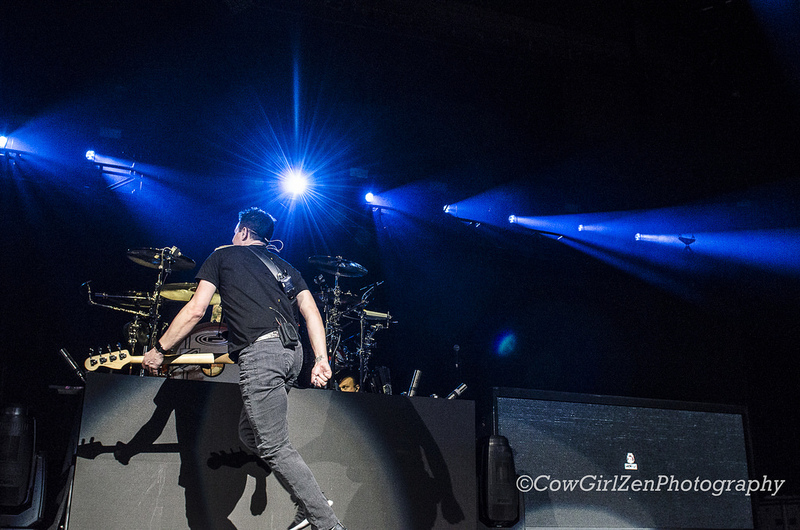 It was a complete evening from beginning to end as Live Nation has always set the standard for concert promotion. 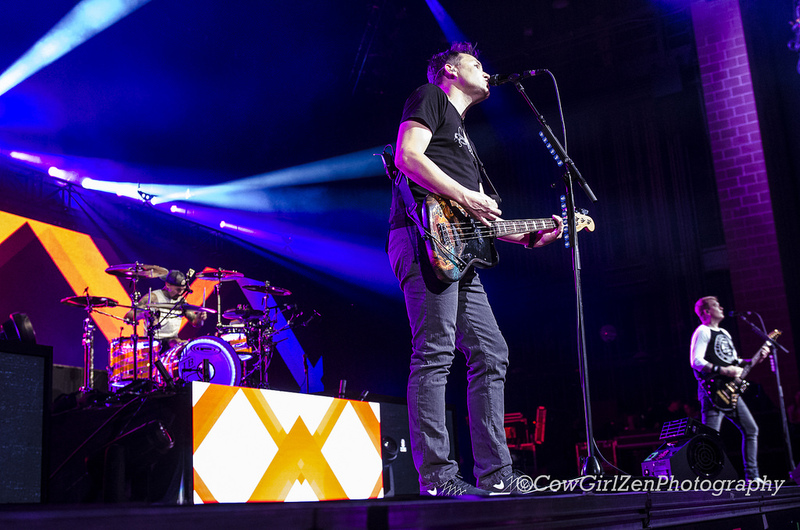 The fans of all ages filled the venue as the lawn section was completely sold out. The crowd was there for all three bands and sang along as the bands each took to the stage and had a music feast with everyone that partook. 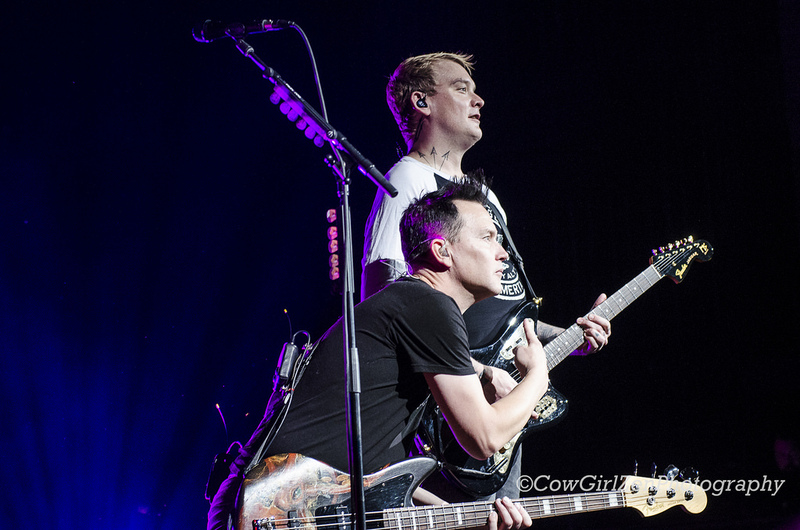 This was a prime combination and every side enjoyed it. By: OM Concert Reviewer for BANGS! 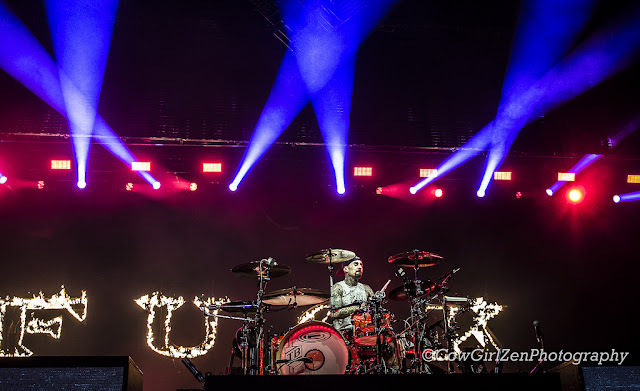 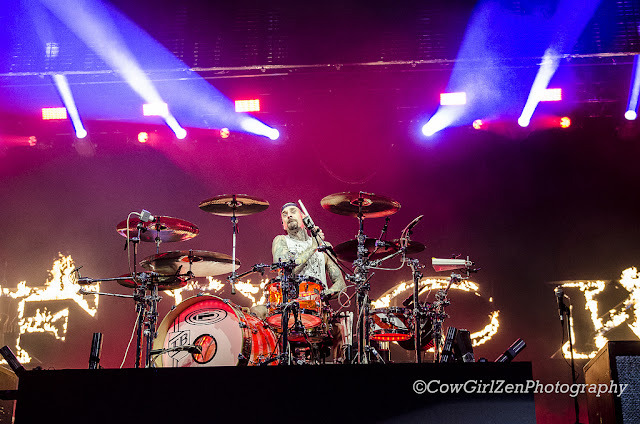 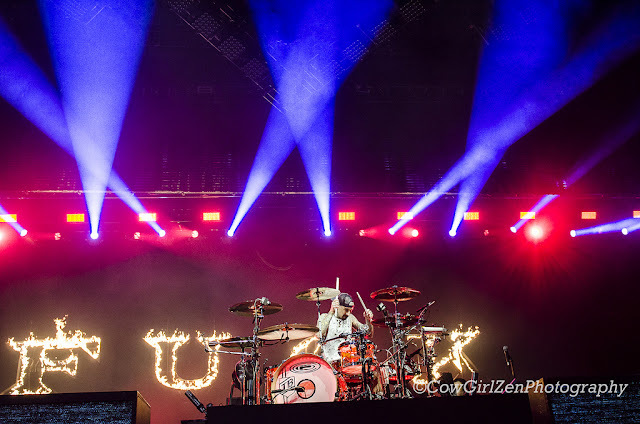 As Blink-182 took to the stage and the letters F * * C K were lit on fire the moments gave way and Blink began with their hit, “Stay Together For the Kids.” Certainly this song could not be any more literal this past Saturday night over at Ak-Chin Pavilion in Phoenix, Arizona. 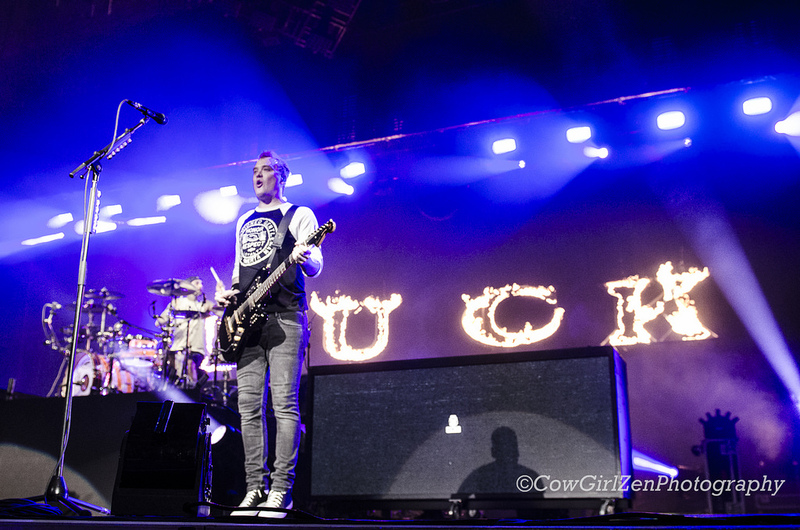 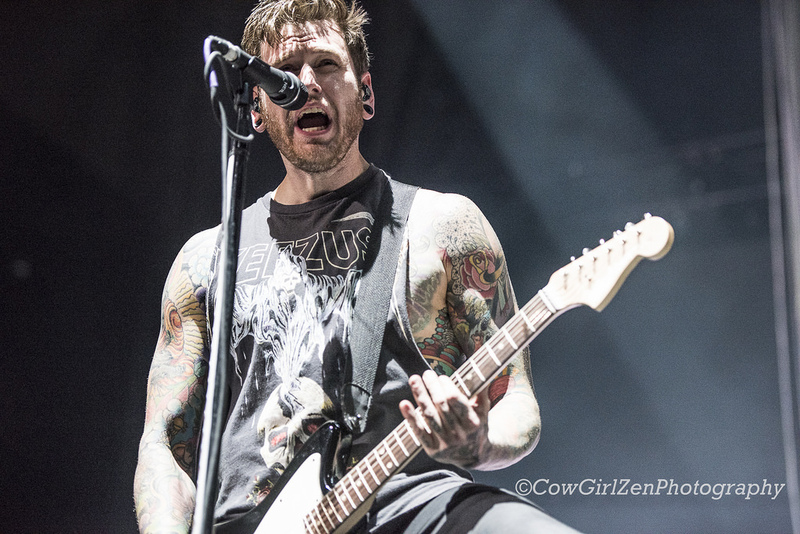 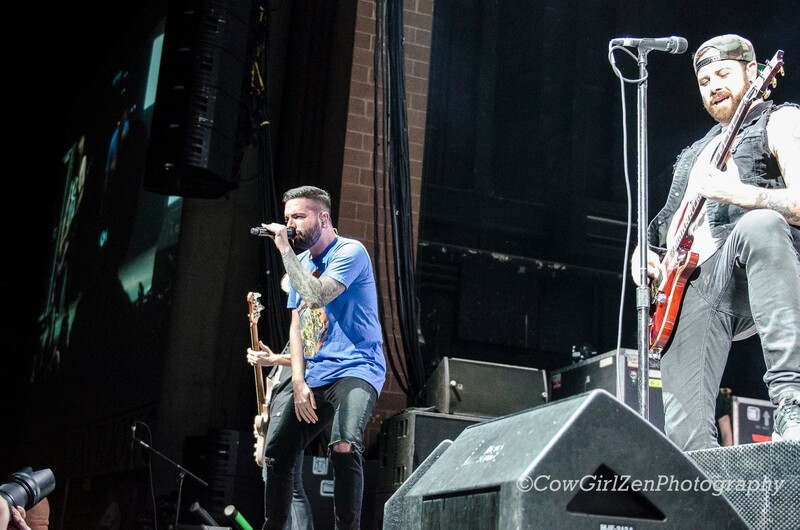 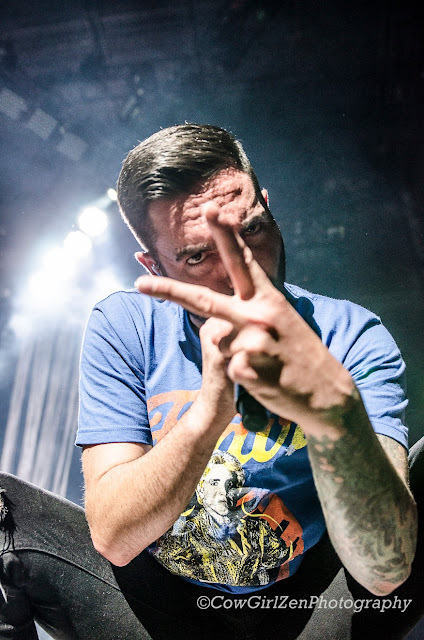 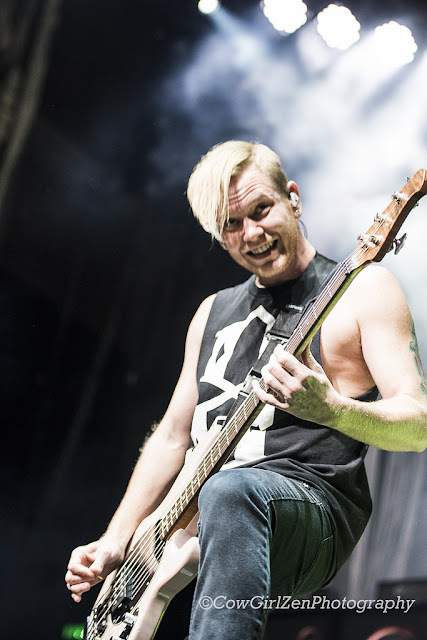 With the perfect pop-punk lineup in the works before them, All Time Low and A Day To Remember, it was clear that Blink-182 were not leaving the skater punk kids hanging anytime soon. 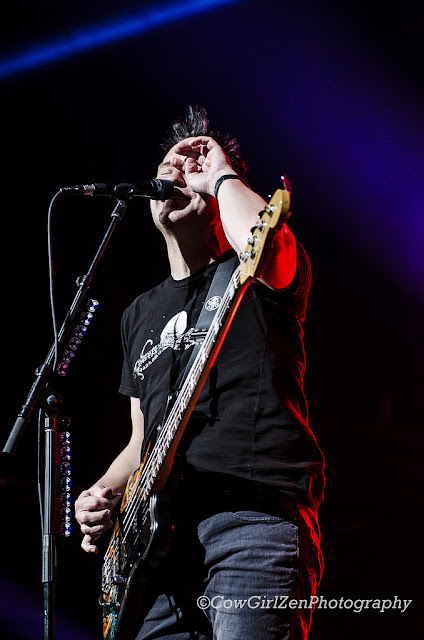 With a black curtain drop, Blink was back, and it wasn’t just a “Family Reunion.” Oh, no. 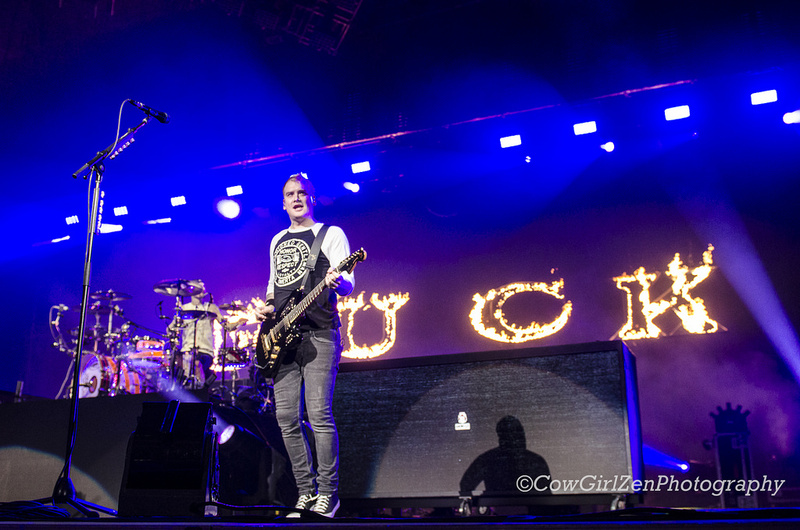 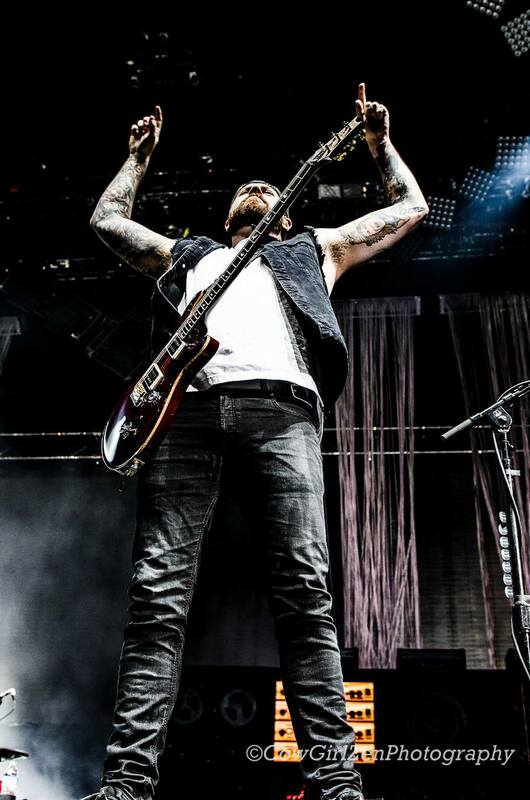 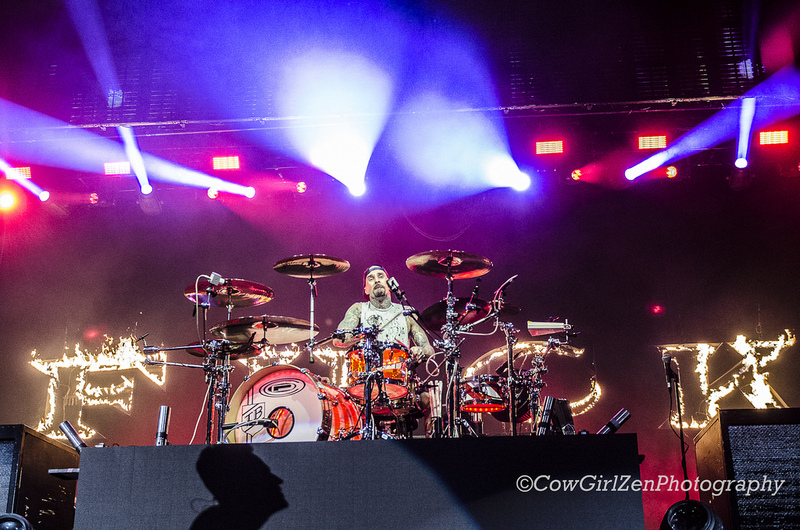 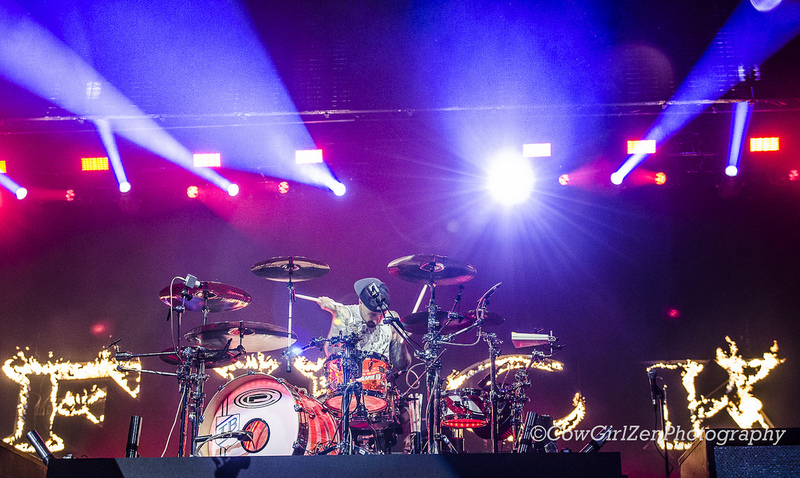 This was Blink-182 back on stage with new and old music to share and ready to get rowdy with all their fans. 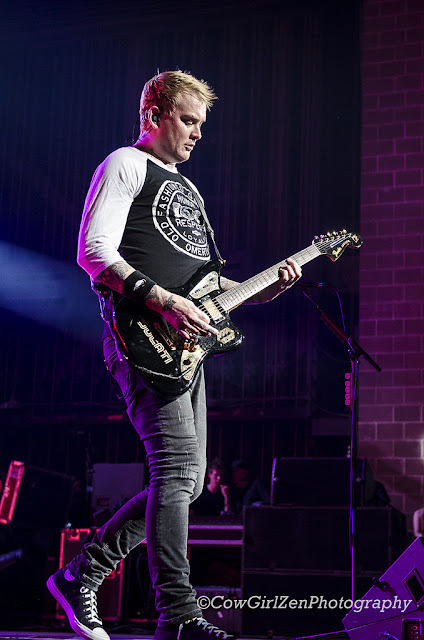 The set began with “Feeling This;” a definite reach out to let the crowd know that they - Mark Hoppus, Travis Barker and Matt Skiba (Alkaline Trio vocalist) - were ready to feel and eat up Phoenix’s energy that Saturday night. 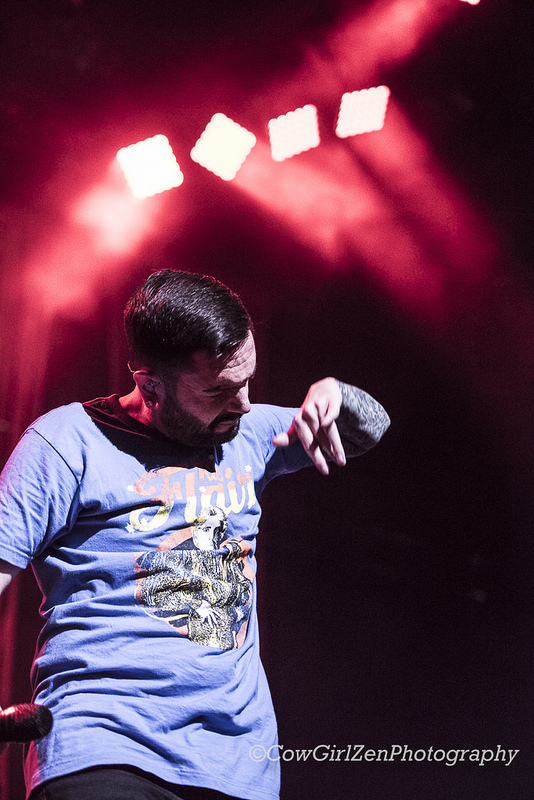 It was time for the ultimate pop-punk show to get kicking in gear. In flow, a beloved classic followed, “What’s My Age Again?.” Following, a 30-second song filled with every curse name in the book, “Family Reunion” was also played in reassurance that Blink-182 was still 15 years old at heart. 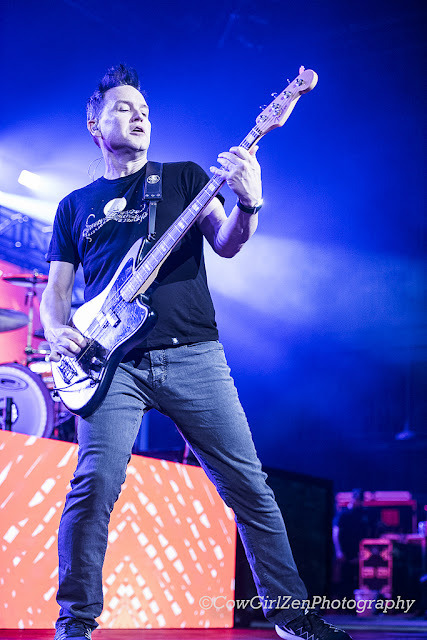 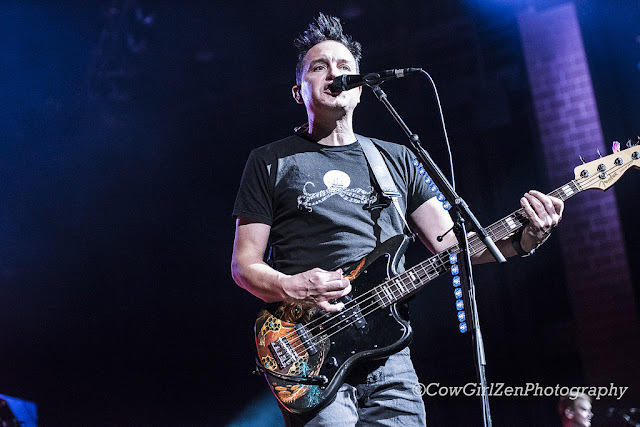 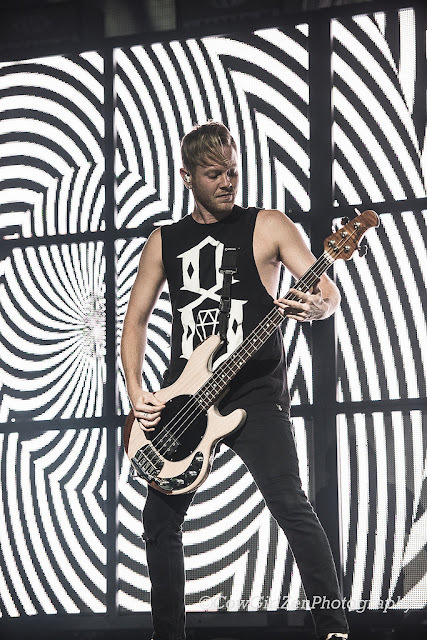 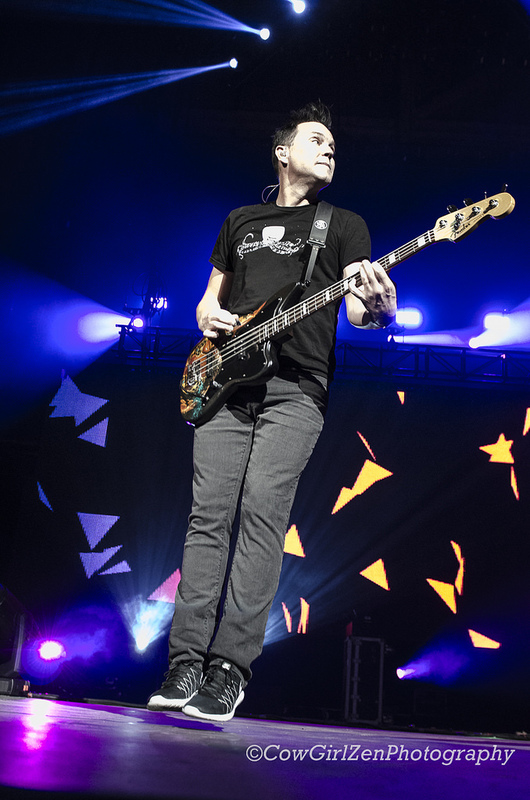 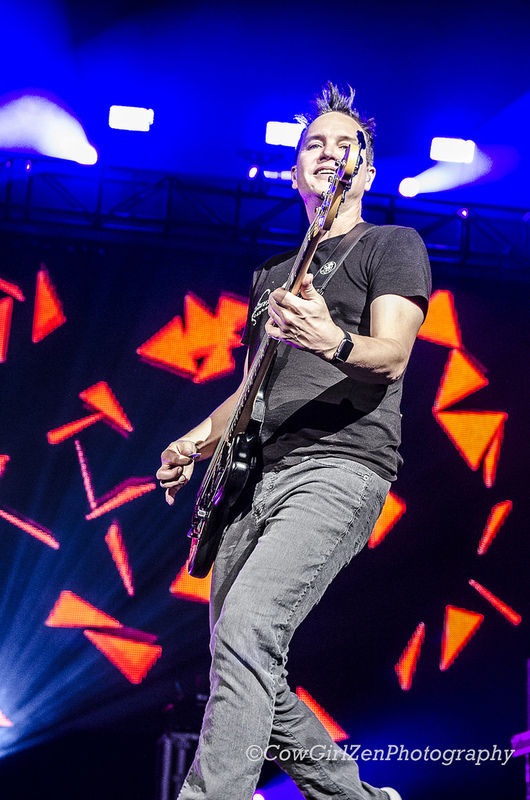 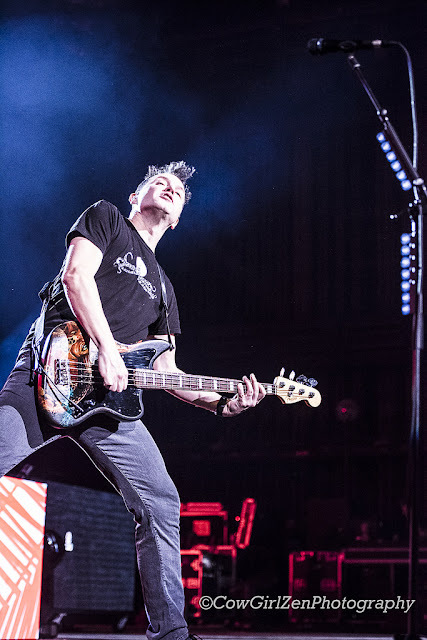 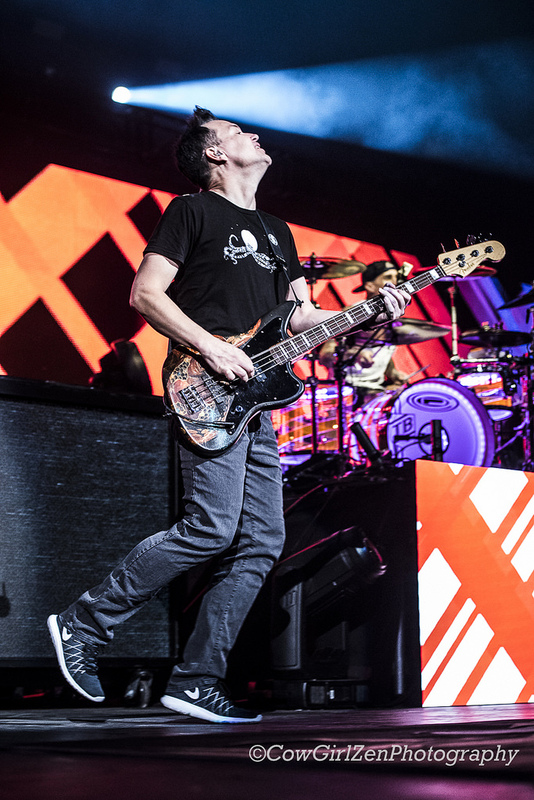 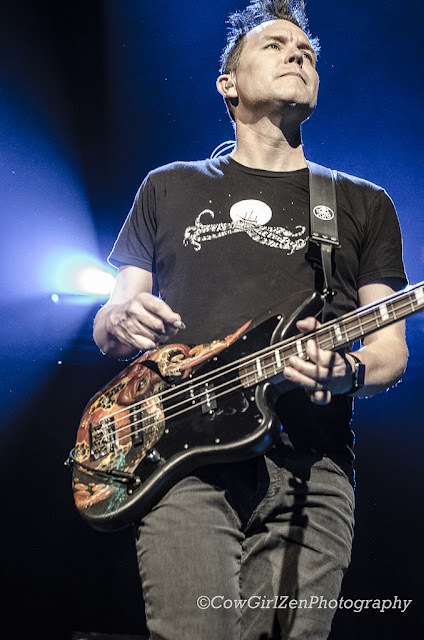 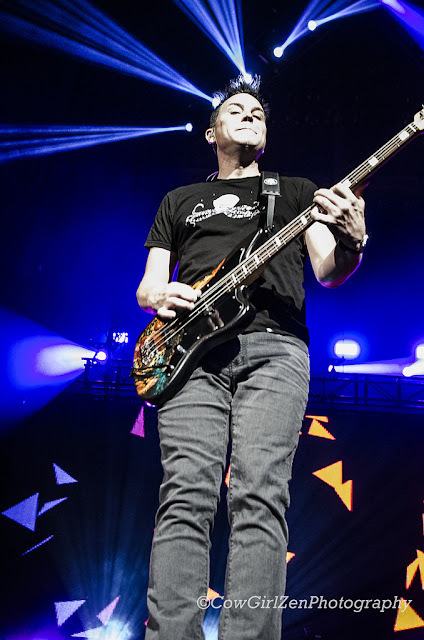 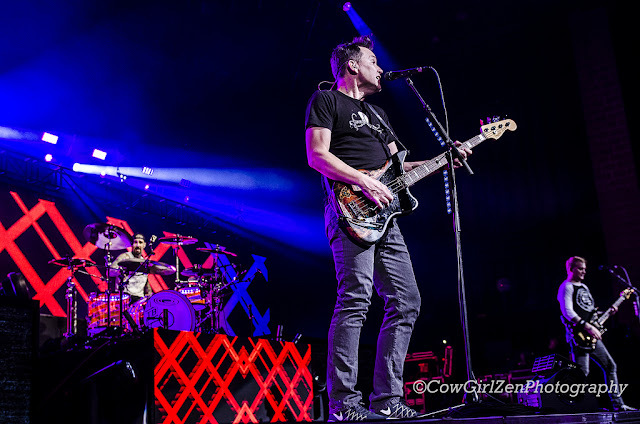 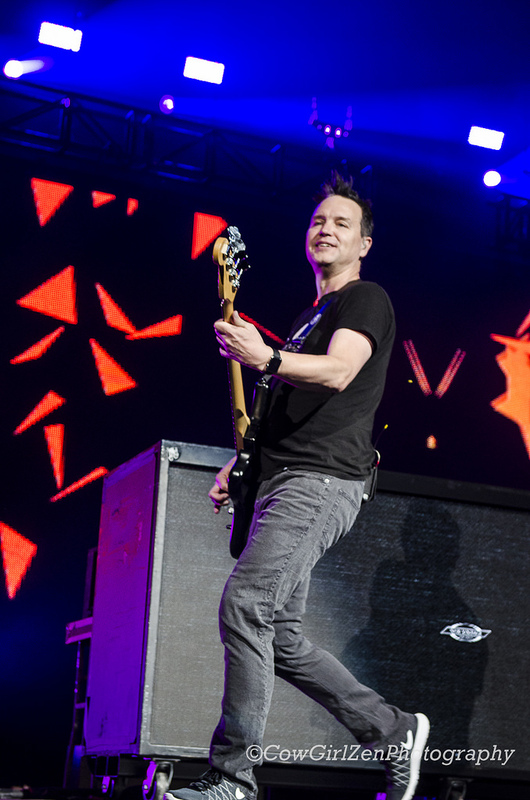 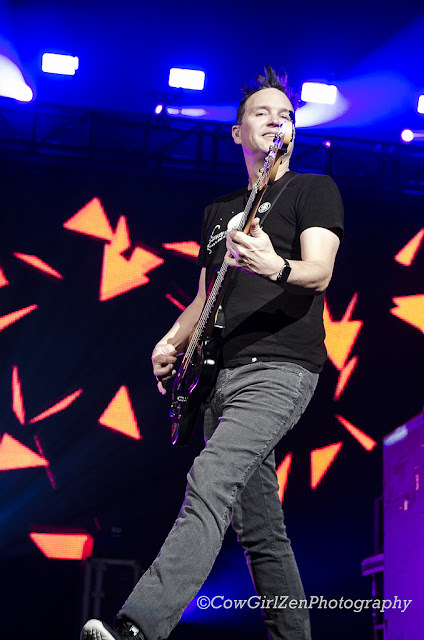 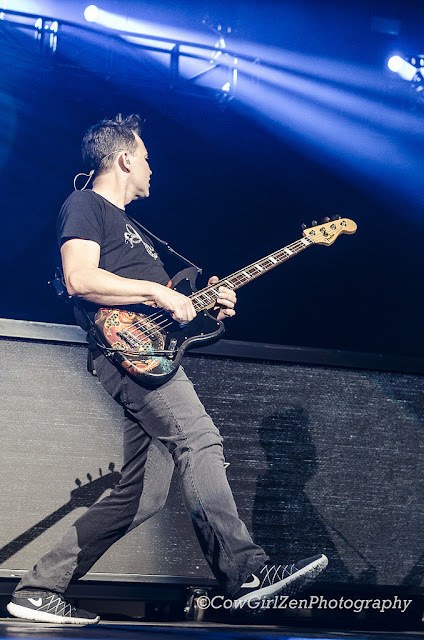 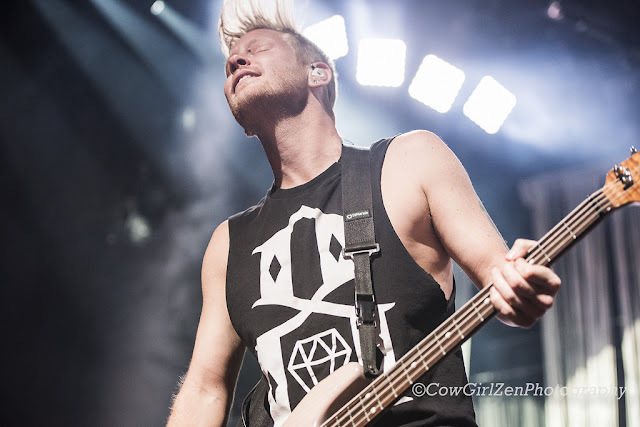 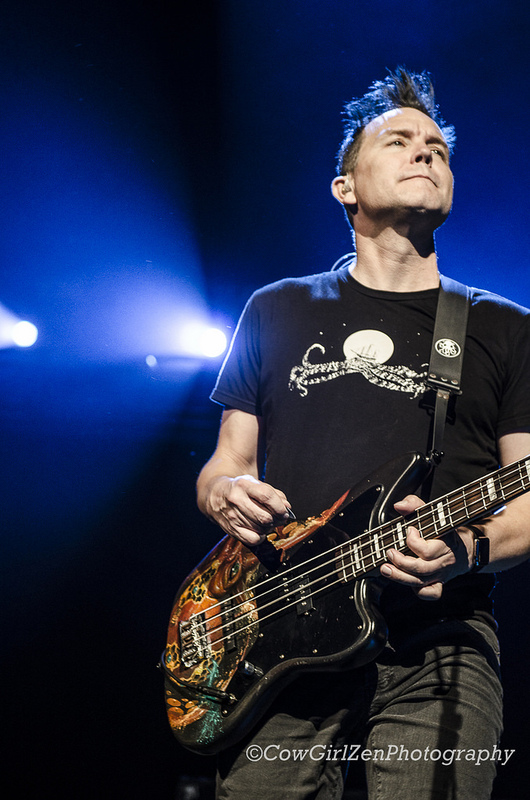 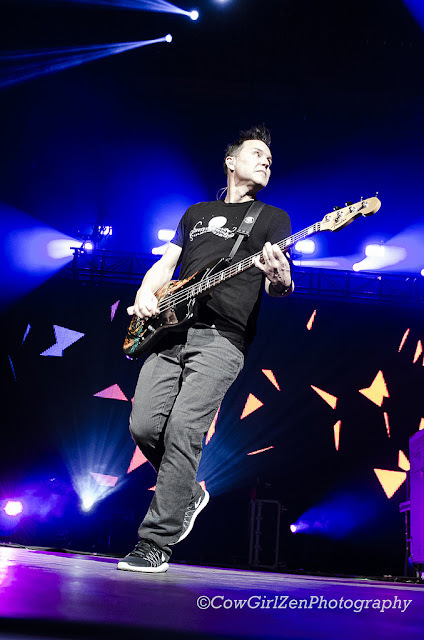 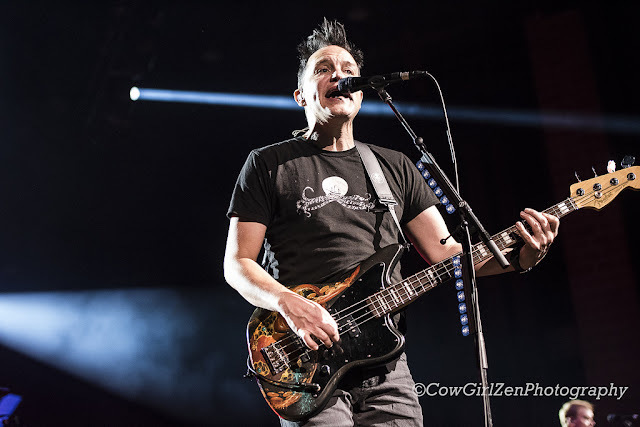 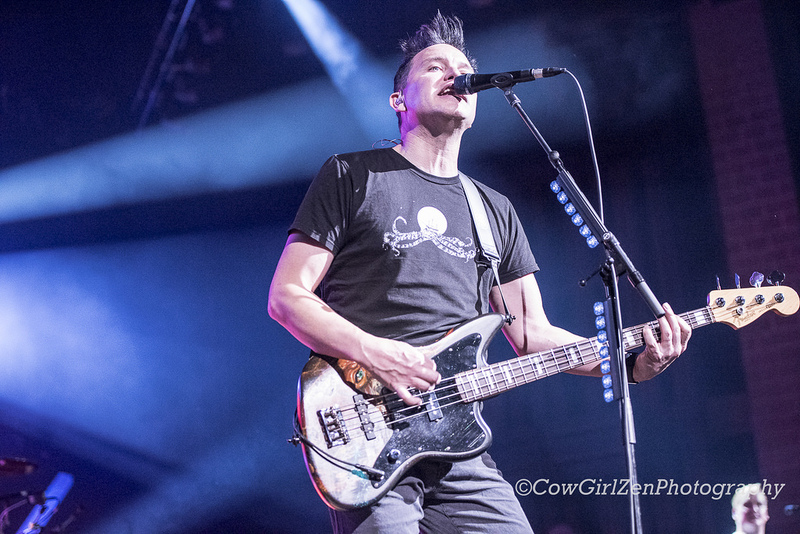 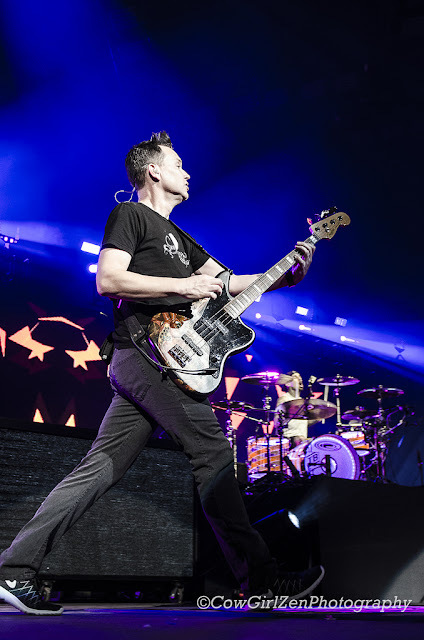 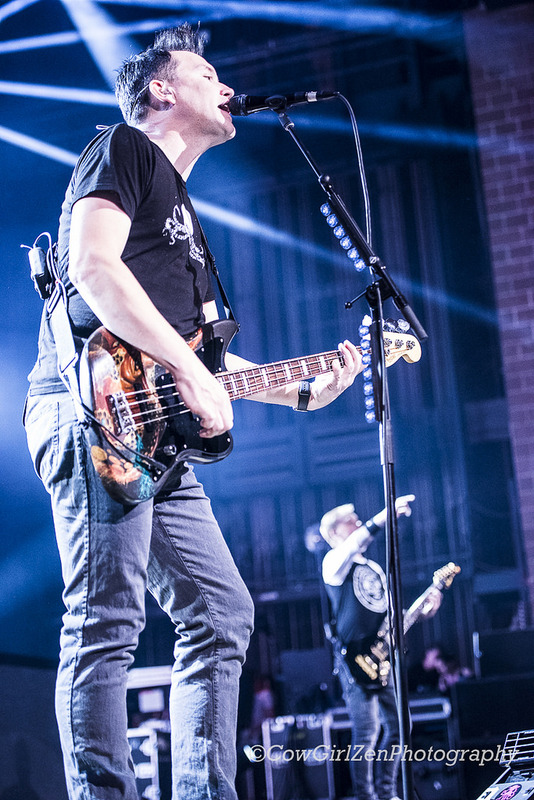 “It’s hot, but it’s a good heat,” bassist and vocalist, Mark Hoppus observed with a grin after the first few songs. 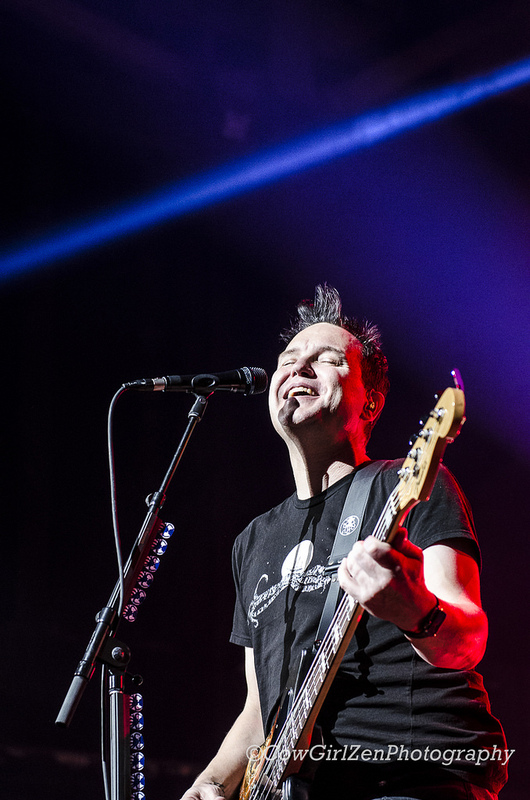 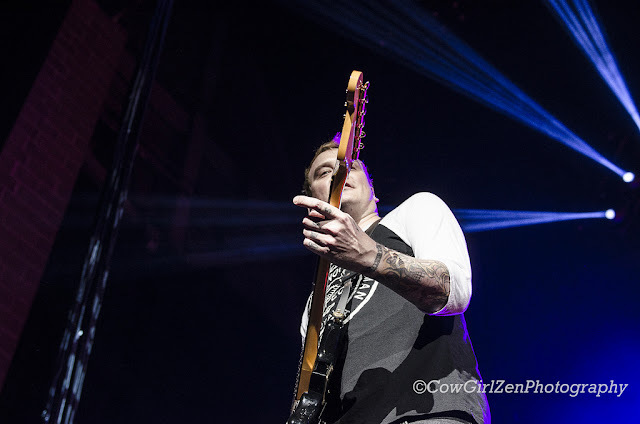 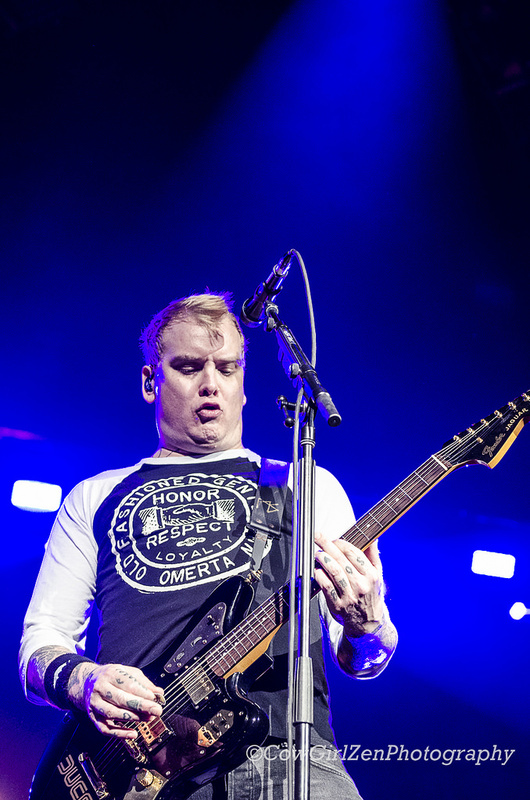 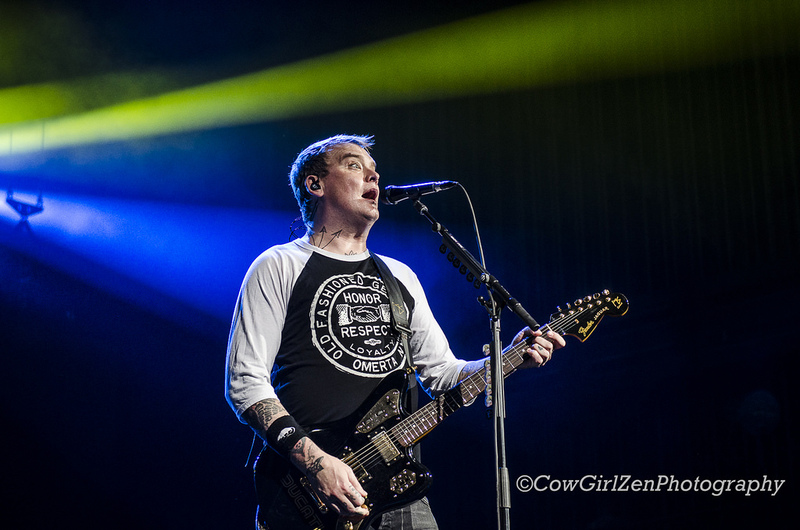 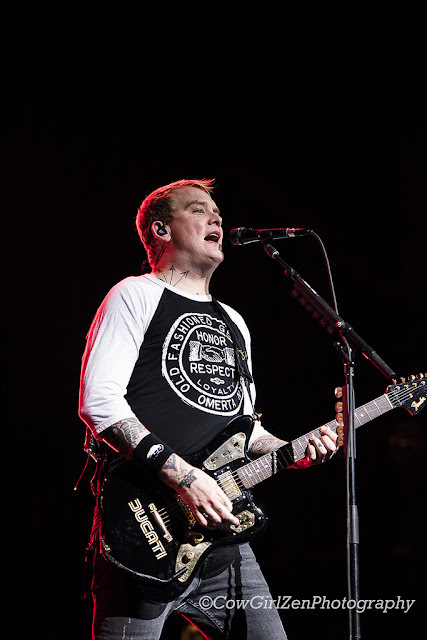 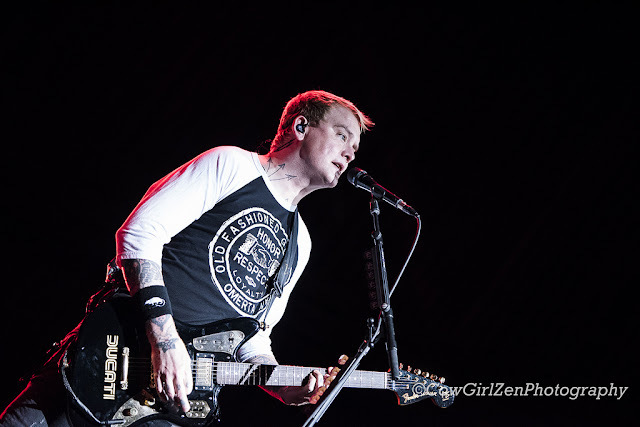 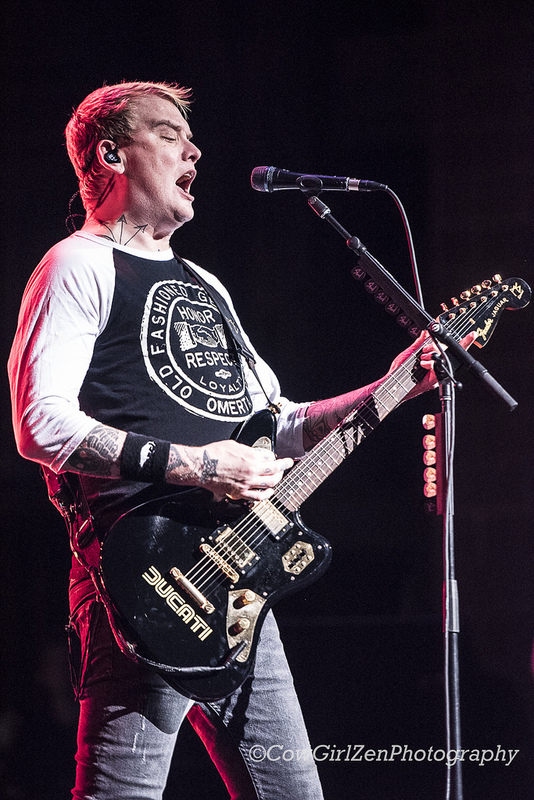 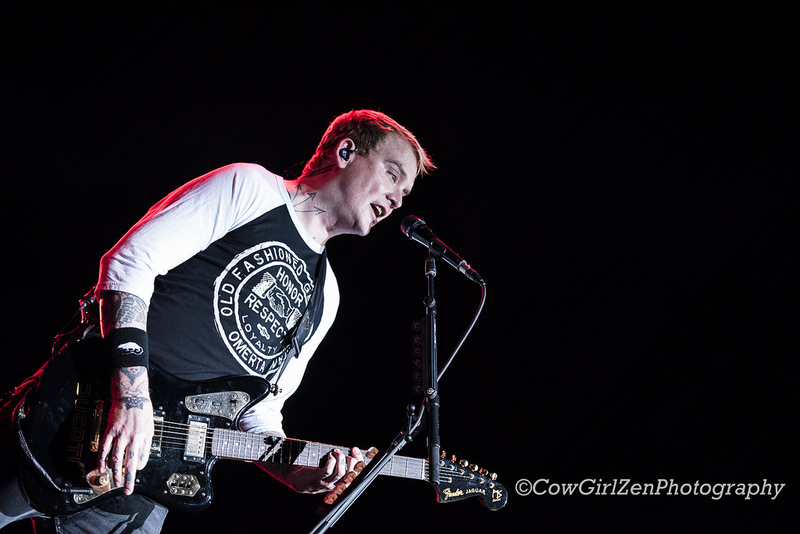 “This one is for the ladies,” Hoppus remarked as Skiba on guitar began those famous chords. And with that, if everyone wasn’t before, this treasured track had every soul in the pavilion singing their hearts out - whether they came with a sweetheart of their own or not. 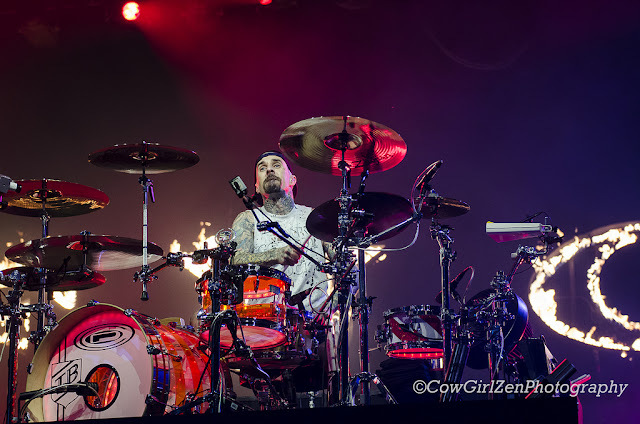 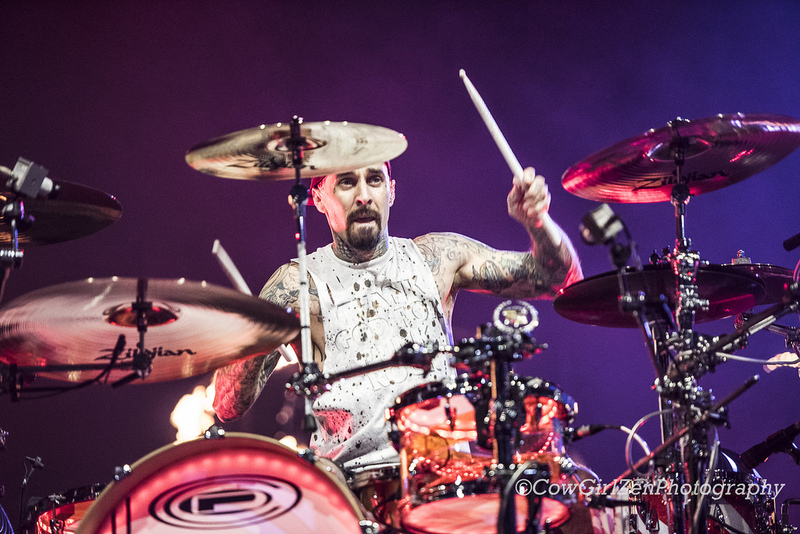 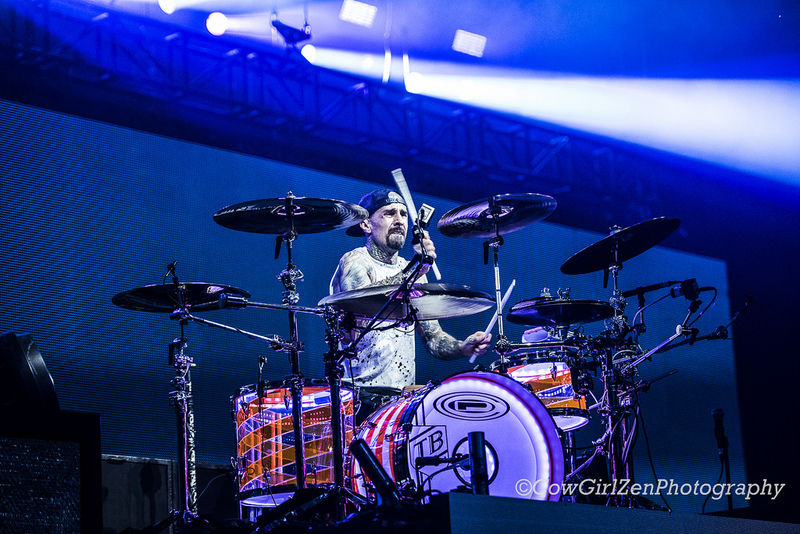 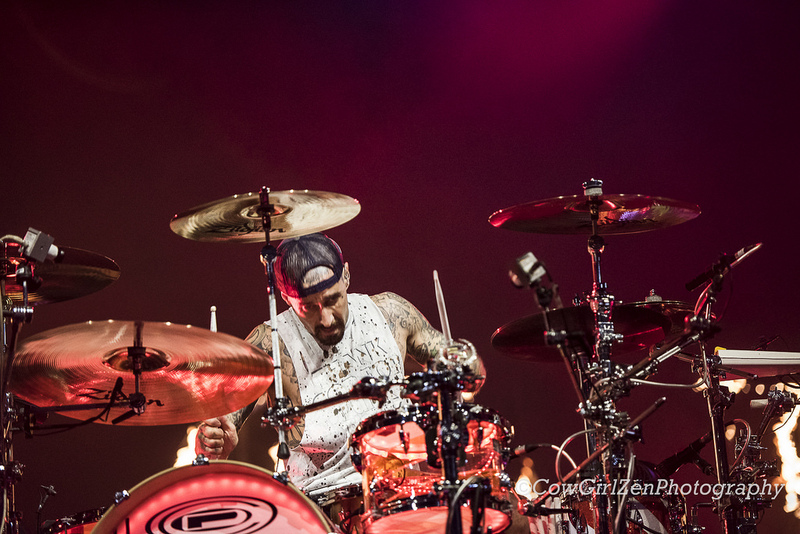 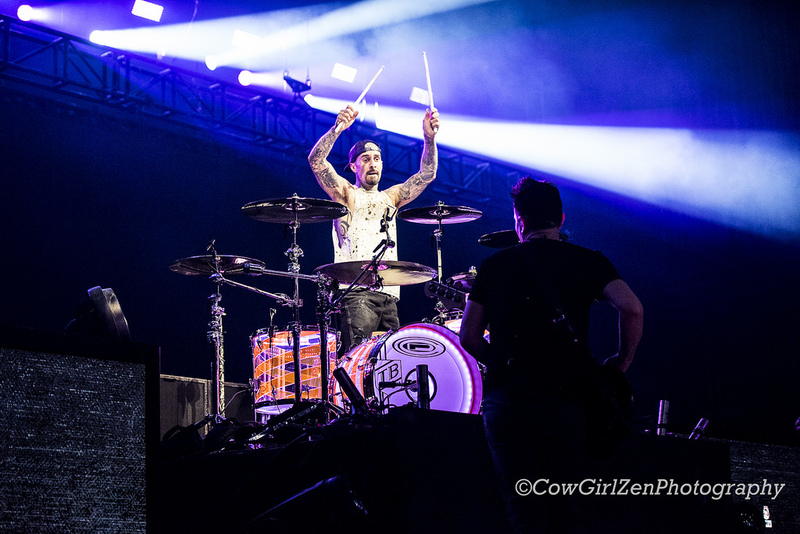 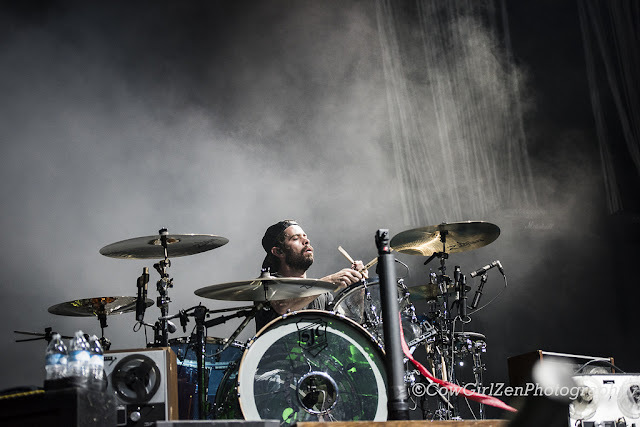 Soaring from a quick drum solo at the end of the song, Blink's 2016 single that reminded one and all how strong Blink-182 soars through everybody’s veins, “Bored To Death” raged through the crowd. 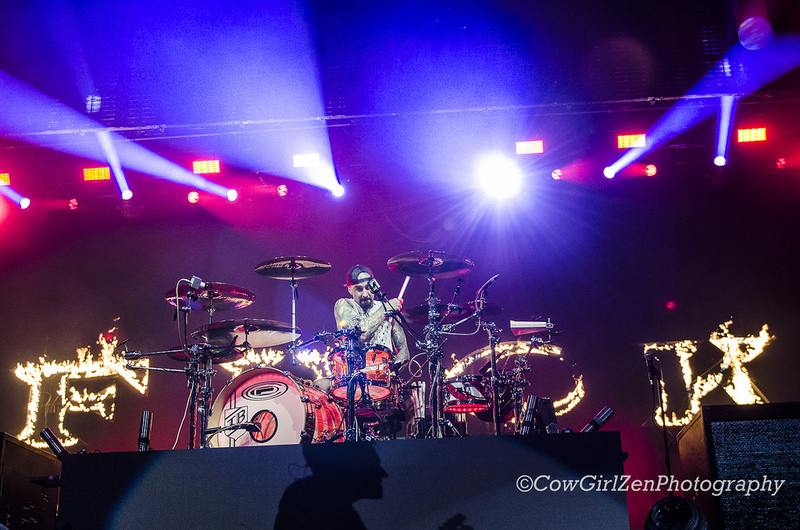 “I wanna see some naked dudes. 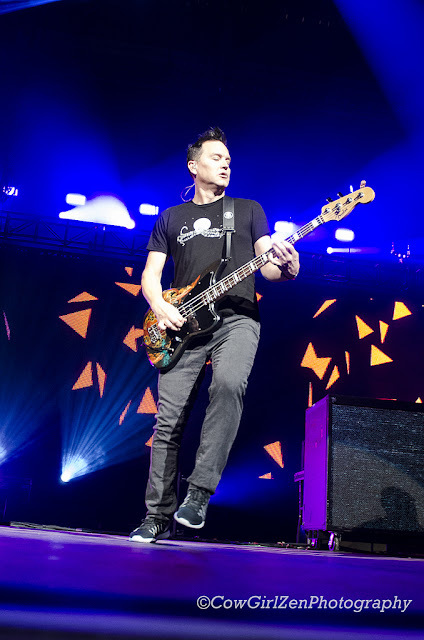 That’s why I built this pool,” Skiba and Hoppus sang as they switched over to “Dumpweed” and inflatable naked ladies crowd surfed on top of the floor audience. 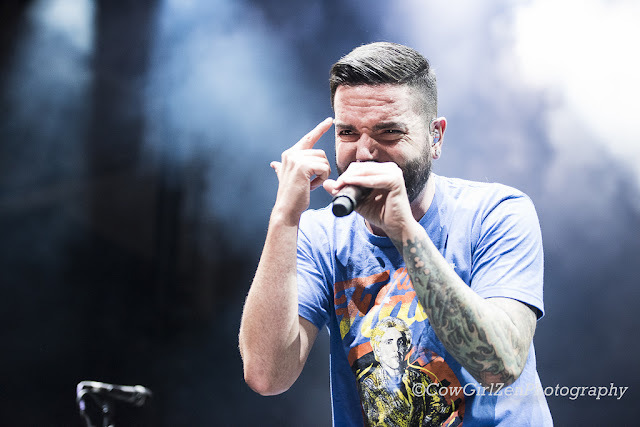 Despite all their shenanigans, inappropriate bathroom humor, and smart-a## lyrics, you can always count on pop-punk to take a moment for those hurting. Hoppus regarded the following before performing their most sober song, “Stay Together For The Kids,”: “Now, I bet all of you have had a fun time tonight. 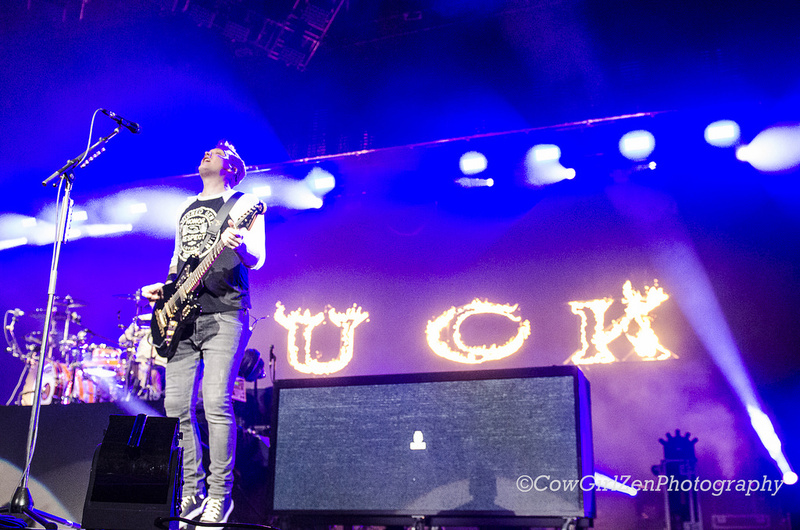 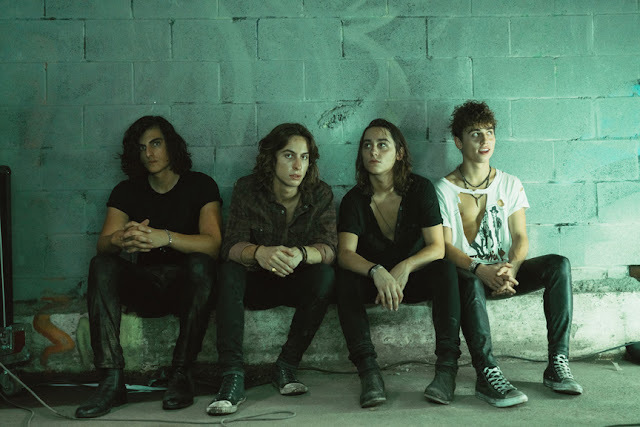 Not anymore tonight Phoenix, not anymore." 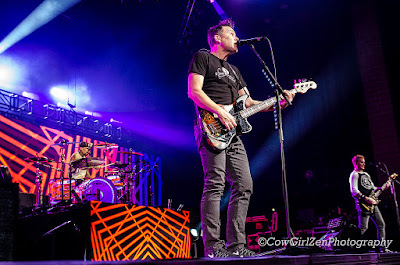 ***With those being “17 without a purpose or direction” and those feeling like “nobody likes you when you’re 23,” it was, without a doubt, an enjoyable show for all ages who attended, including singles, couples, friends, and even parents and kids sharing an iconic night.